Karen Wickre, a former colleague and communications professional who is known for shaping the voice of Google, recently released her book, Taking the Work out of Networking. In it, she lays out strategies to help introverts network in ways that feel natural to them. While I’m by no means an introvert, this did get me thinking about my own experience networking. 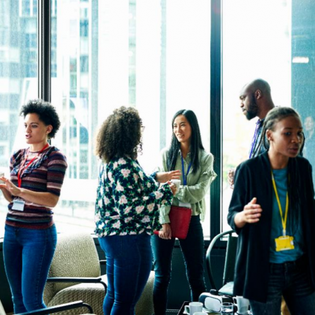 There is no doubt that networks are powerful tools, and more often young professionals are being told to network as if it is an obligation of their career. Technology platforms have been created to help people network better. Companies now even dedicate time and events purely for networking purposes. Part of this is positive because it recognizes the value of building new relationships, but part of it is also negative because it makes it easier to lose sight of what networking really is. At its core, networking is making a meaningful and valuable connection at multiple levels, including with the individuals networking and within the greater ecosystem they belong to. In other words, networking isn’t just about you. To see it that way is shortsighted, in my opinion, and it also adds an unnecessary amount of pressure to an activity that already makes many uncomfortable. The community connection, to me, is the definition of successful networking. To achieve it, I like to remind myself of three main principles I’ve learned along the way. It’s easy to want to network for a short-term end goal, to want the time you put into networking to always result in something of benefit or usefulness to you. But that won’t always be the case, and networking is that much more enjoyable when it’s a little unintentional and for the purpose of making a connection at that moment in time, rather than for some sought-after return. Networking should be authentic because it should be a natural extension of your own genuine interest, instead of something more purposeful. I started returning to my alma mater, USC, as a guest lecturer because I wanted to give back to a place that gave me great memories and a good education. In the process of getting involved again, I was invited to give more talks about my entrepreneurial journey, which in turn lead to students learning about my company. The talks were not intended to be a recruitment channel, I was just there to talk about my career path, but in the end, it resulted in dozens of applicants to my company, many of whom became valued employees. The traditional (and perhaps easy) way of thinking about networking is to focus on the development of one-on-one relationships. I think there’s a better way to think about it, and that’s by taking a step back and recognizing that networks are really ecosystems. Consider the ecosystem approach many tech firms use, which means developing technology and business models that benefit all participants in the ecosystem. I believe in approaching your networks in the same way, where your role is really to share information, create opportunities and support others in ways that make the ecosystem you’re in that much stronger. Networking can often take on the stigma of being very transactional, and I’ve both heard and complained myself about it being a “chore.” But a shift in perspective can make networking feel like a much more inspiring activity. I like to remind myself that my network is a community that I’m building and that I should take ownership of this community. By that, I mean that I should maintain it and give back to it without expecting anything specific in return. The danger of thinking transactionally is that it is a shortsighted way of networking and may ultimately lead to a more limited network. A community, on the other hand, lasts a long time and will come together for you at surprising moments. The thing to remember is that networking doesn’t always have to mean something, and it certainly shouldn’t be an instant sales pitch. You may simply be motivated to stay in touch or connect with someone due to a shared interest or experience — do that, and let the result surprise you. I’ve learned that it’s not about networking, the verb, but rather your network, the noun, and how to grow, expand and nurture it in a way that benefits not just yourself but the other participants as well. It’s a difference in angle, but by looking at your network from above rather than out from the center, you’ll be able to give more to your network while also gaining more from it.